The ICCLab developed a new High Availability solution for OpenStack which relies on DRBD and Pacemaker. 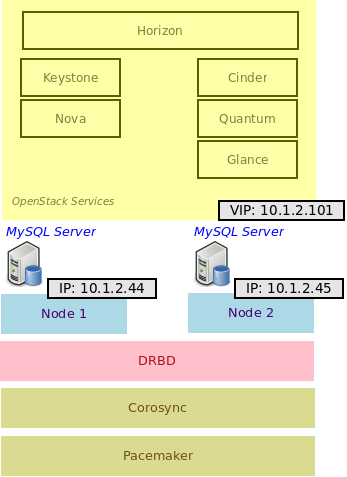 OpenStack services are installed on top of a redundant 2 node MySQL database. The 2 node MySQL database stores its data tables on a DRBD device which is distributed on the 2 nodes. 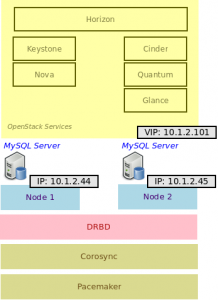 OpenStack can be reached via a virtual IP address. This makes the user feel that he is dealing with only one OpenStack node. All OpenStack services are monitored by the Pacemaker tool. When a service fails, Pacemaker will restart it on either node. Fig. 1: Architecture of OpenStack HA. The 2 node OpenStack solution can be installed automatically using Vagrant and Puppet. The automated OpenStack HA installation is available on a Github repository. This entry was posted in Articles, HowTos, Open Source and tagged DRBD, High Availability, openstack, vagrant by benn. Bookmark the permalink.